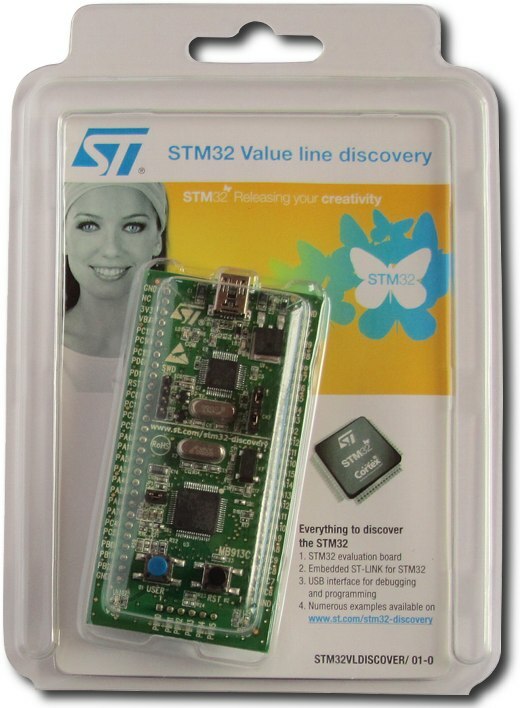 The STM32 Value Line Discovery evaluation board from ST Microelectronics is a low cost board for evaluating the STM32F100 range of 32-bit ARM Cortex-M3 microcontrollers. It is priced at around $12 US. The board comes packaged in a transparent plastic blister pack with a single cardboard printed insert that contains information on where to find resources for the board on the ST website. A quick test to check that the board is working by running the pre-loaded firmware program is printed on the back of the cardboard insert along with system requirements and supported toolchains. The only piece of hardware required to start using the board is a USB type A to mini-B cable and a spare USB port on a PC. A Windows platform is required to run one of the development toolchains for STM32 microcontrollers. Toolchains from Atollic, IAR and Keil are available for purchase. These toolchains also have restricted evaluation versions. A GNU ARM toolchain such as YAGARTO can also be used. 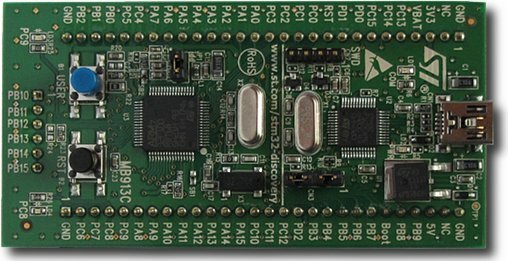 Soldered on the board is a STM32F100RB microcontroller packaged in a 64-pin LQFP (Low-profile Quad Flat Pack). This microcontroller contains a ARM Cortex-M3 core with Thumb-2 32-bit instruction set. This microcontroller is part of the STM32F1 Mainstream series of Cortex-M3s from ST. Within the STM32F1 Mainstream series, it falls into the STM32F100 Value line category. The ST-LINK is a ST Microelectronics USB JTAG tool for programming and debugging STM8 and STM32 microcontrollers. It is an external tool that is used to program and debug STM microcontrollers using JTAG or SWD (Serial Wire Debug). An embedded ST-LINK is included on the STM32 evaluation board that can be used to program the on-board STM32F100RB microcontroller. The embedded ST-LINK can also be used to single-step through source code and debug the target microcontroller. By removing two jumper links on the board, the embedded ST-LINK can be used as a programmer / debugger to program / debug an ST microcontroller on another board via a cable from the SWD connector. The embedded ST-LINK is limited to programming STM32F microcontrollers via an SWD link only. JTAG is not supported by the embedded ST-LINK. The board features two user programmable LEDs and a user programmable push-button switch. A second push-button is connected to the reset pin (NRST) of the microcontroller. All of the I/O pins of the STM32F100RB are available on pin headers. Two 28-pin headers are located on either side of the board along its length, one per side. A 6-pin header is located at the end of the board opposite the USB connector. The pin names are silk-screened next to the pin headers. The pin headers protrude from the top of the board allowing easy attachment of oscilloscope or logic analyser test probes. Although the STM32F100RB has two internal RC oscillators, two crystals are interfaced to it – an 8MHz crystal for the main oscillator and a 32.768kHz crystal for the real-time clock. The 8MHz crystal is housed in a socket allowing it to be removed and replaced by a crystal with a different value. The board has a number of solder-bridge connectors that can be soldered closed or de-soldered to open them in order to make or break connections. For example, the 32.768kHz crystal is connected to multiplexed pins on the microcontroller – pins that can be used as I/O or for the crystal. On the board these pins are connected to the crystal and to the pin headers via two solder-bridge connectors that are open by default. If the crystal is not needed, it can be removed and the solder-bridges closed to connect the I/O pins to the board's pin headers, thus gaining two I/O pins that were previously dedicated to the crystal. A jumper link on the board can be removed allowing an ammeter to be connected if current consumption of the microcontroller needs to be measured. Before using the board take note that use of the board is restricted by the ST Microelectronics Evaluation Product License Agreement. Part of the license agreement states that the evaluation board is to be used only for evaluating and testing the microcontroller and is not allowed to be used in a product that is to be sold. It can be used in a demonstration system, but the demonstration system may not be leased or sold. There is also no warranty on the board which is fine as it could be damaged in any number of ways while being evaluated. Plugging the board into the USB port of a PC will provide power to the embedded ST-LINK and the STM32F100 microcontroller being evaluated. It is also possible to power the board with an external 5V or 3.3V power supply by connecting it to the 5V or 3.3V pins of the board's headers. After plugging the board into a USB port for the first time, the red power LED near the USB connector lights up and the program in the STM32F100 starts running. This program will flash the green LED on and off that is situated at the opposite end of the board to the USB connector. In Windows, the embedded ST-LINK on the board will register as a USB drive that will open in a window displaying its contents. The drive contains three links to HTML pages on the ST website. The default program running on the ST32F100 can be tested by pressing the USER button on the board to change the rate at which the green LED flashes. The board is great for testing one of the toolchains and getting initial programs running without interfacing any external hardware. The two LEDs and the push button can be used as I/O for initial programs. Interrupts and internal peripherals such as timers can also be evaluated without adding external hardware. 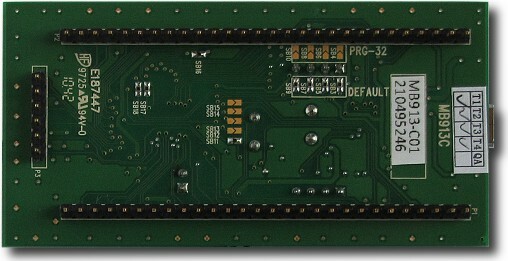 The two 28-pin headers on either side of the board are pitched right for connection of the board to breadboard or stripboard for rapid hardware prototyping. Unfortunately the 6-pin header at the end of the board makes connection awkward. The board will not plug into a single breadboard, it needs to be plugged across two breadboards. Using two female 28-pin SIL connectors gives enough height to clear the 6-pin header from stripboard (where it would short out all six pins) or breadboard. If using two SIL connectors to get height for breadboard use, the pins of the SIL connectors will need to be long enough to properly connect to the breadboard, if not, solder the SIL connectors to stripboard and then use two 28-pin male headers to connect from the stripboard to breadboard. Unfortunately there is no JTAG header on the board for easy connection and evaluation of an external ST-LINK. A break-out board would be needed to connect an external ST-LINK. The STM32 Value Line Discovery evaluation board is a great basic board for starting with, learning and evaluating STM32F100 microcontrollers, and at the very low price, it won't break anyone's budget. Inclusion of an embedded ST-LINK makes this board a stand-alone solution to evaluating the STM32F100 without having to buy any extra hardware.